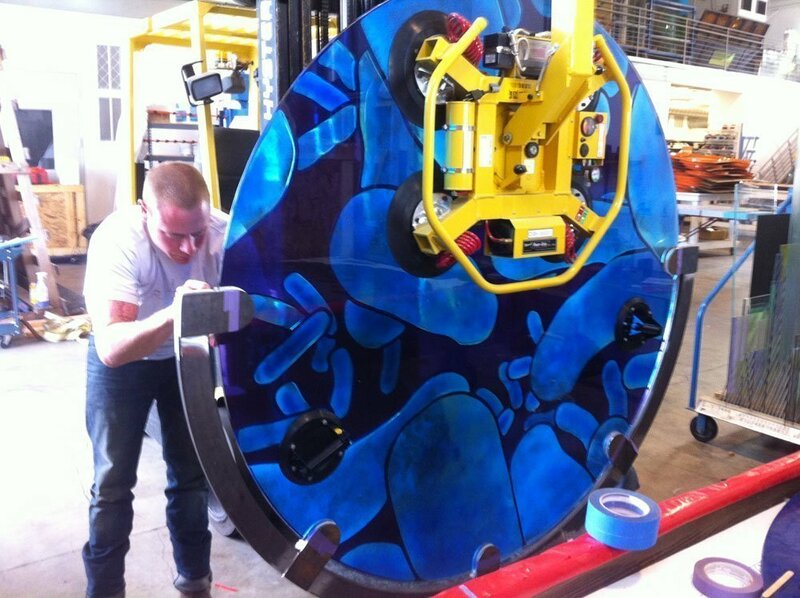 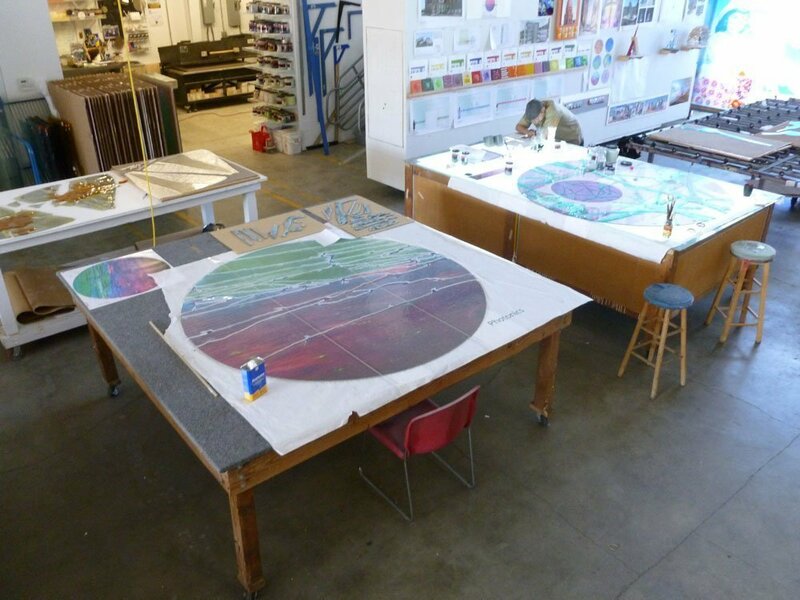 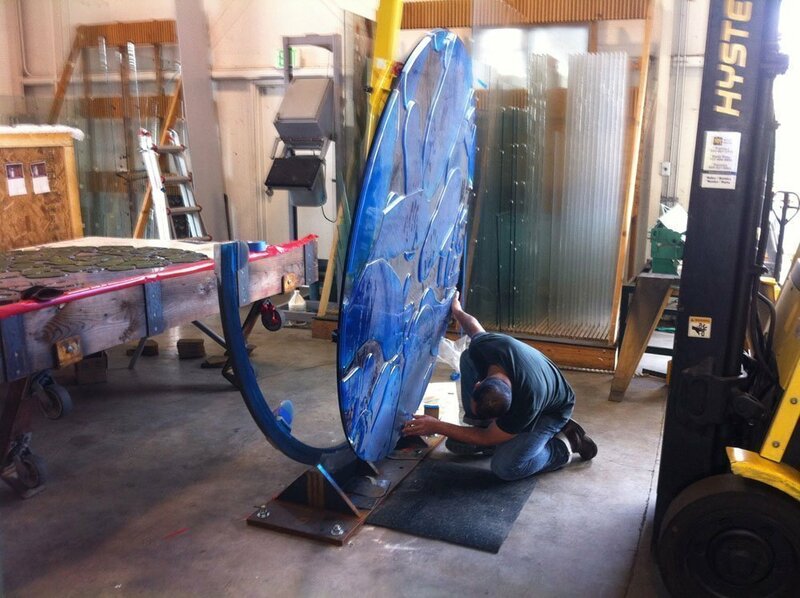 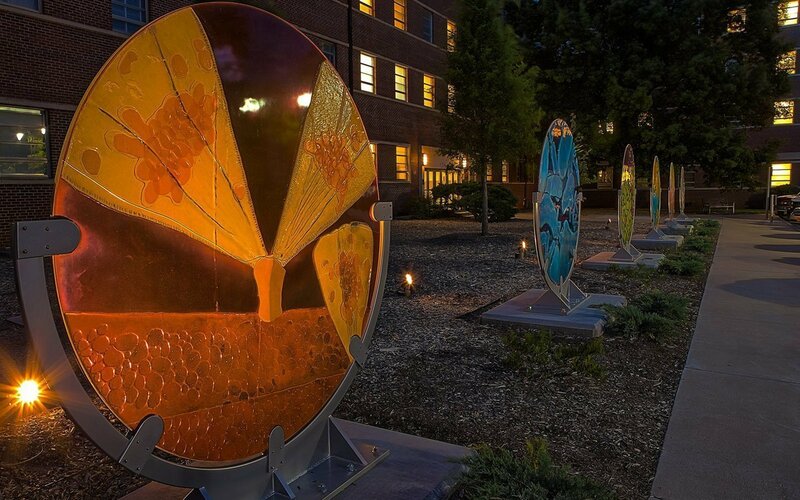 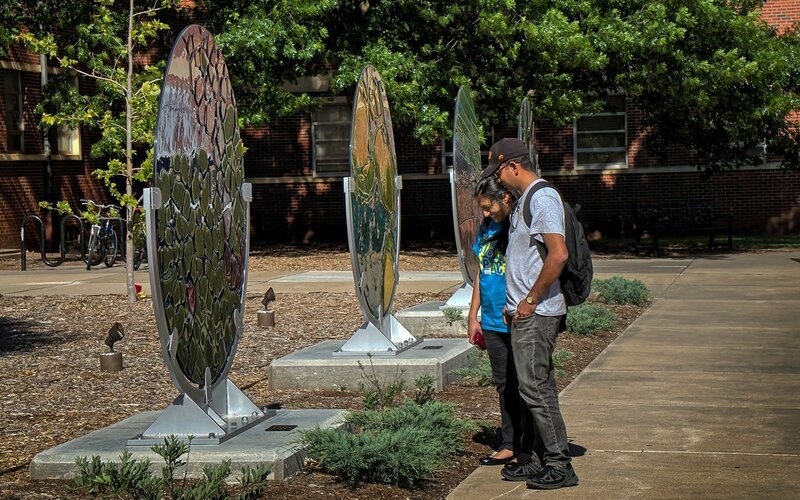 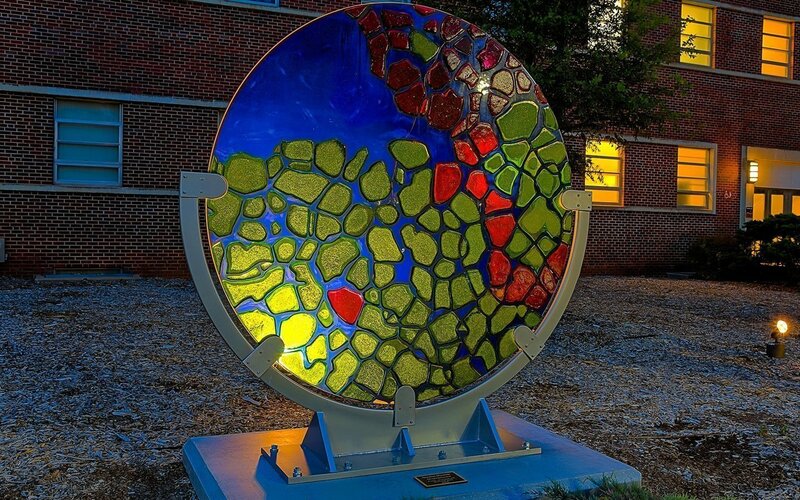 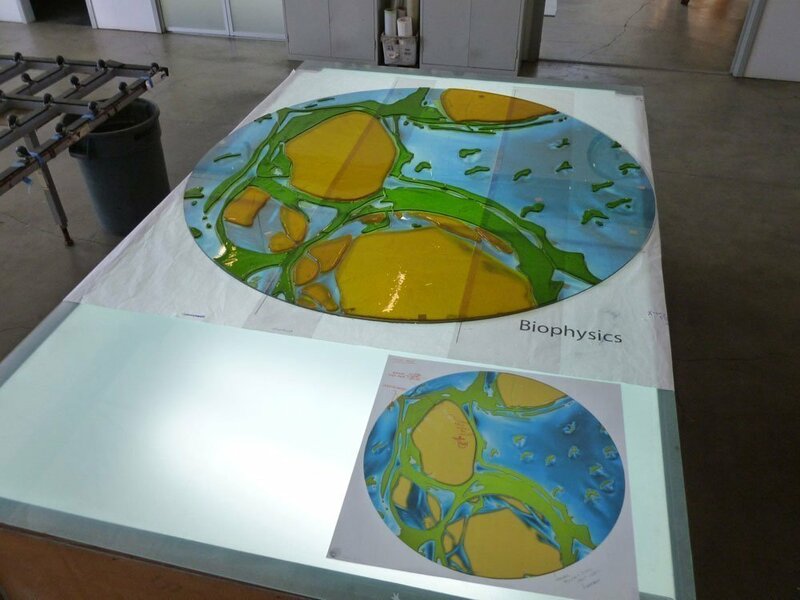 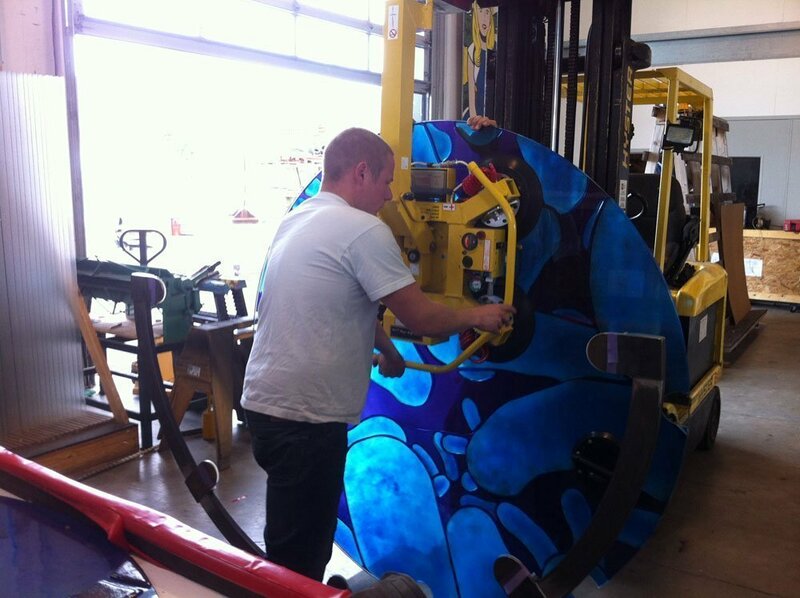 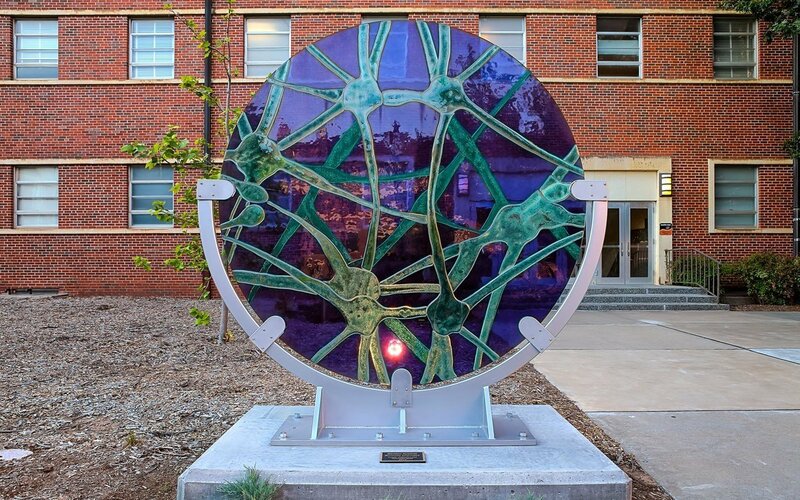 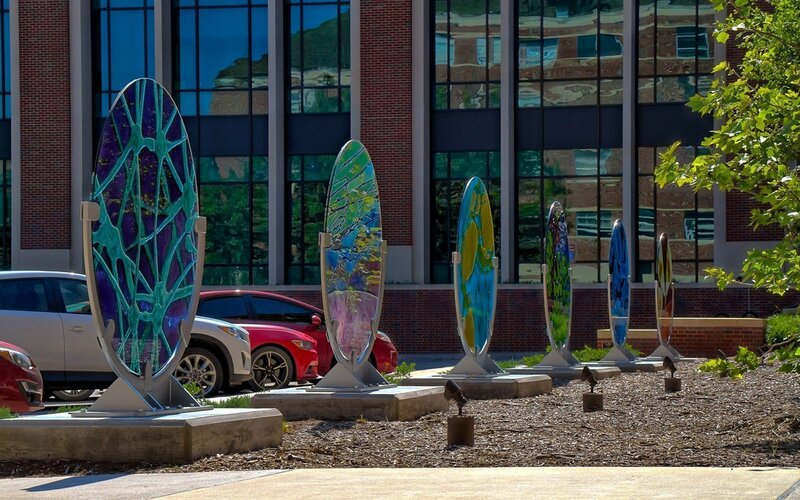 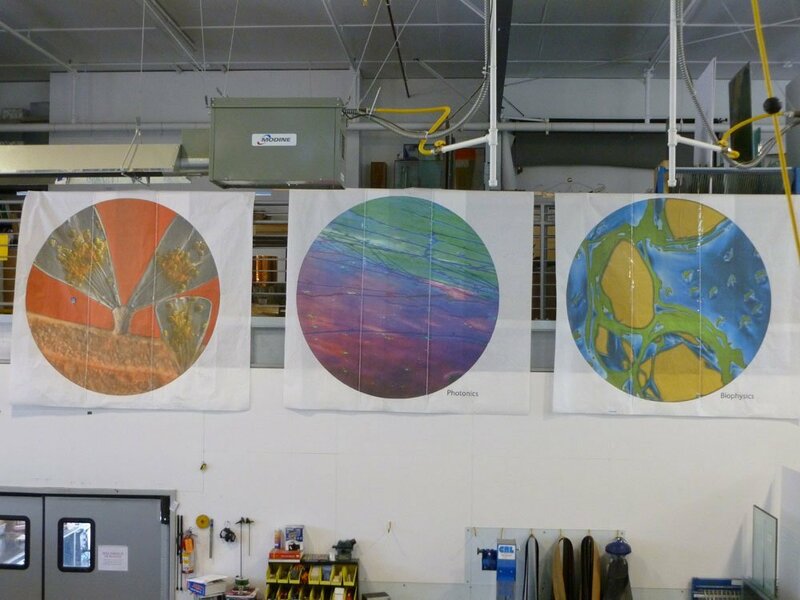 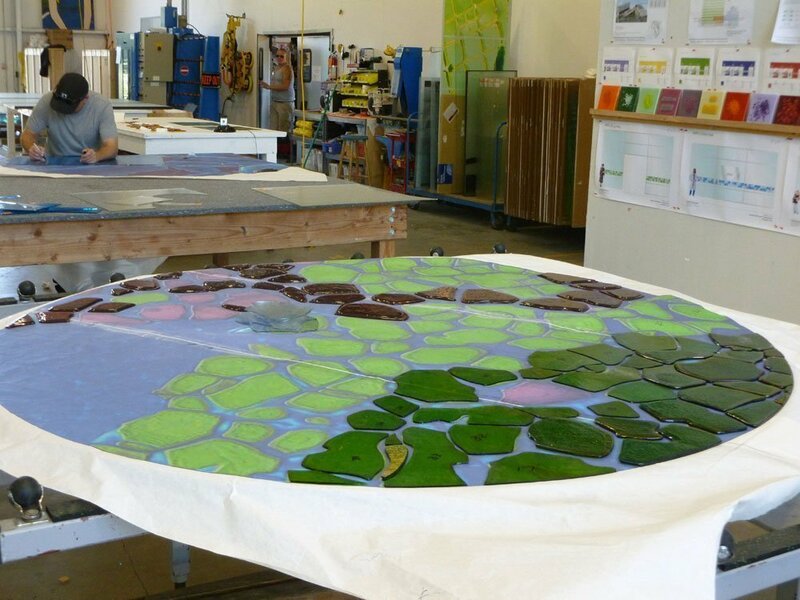 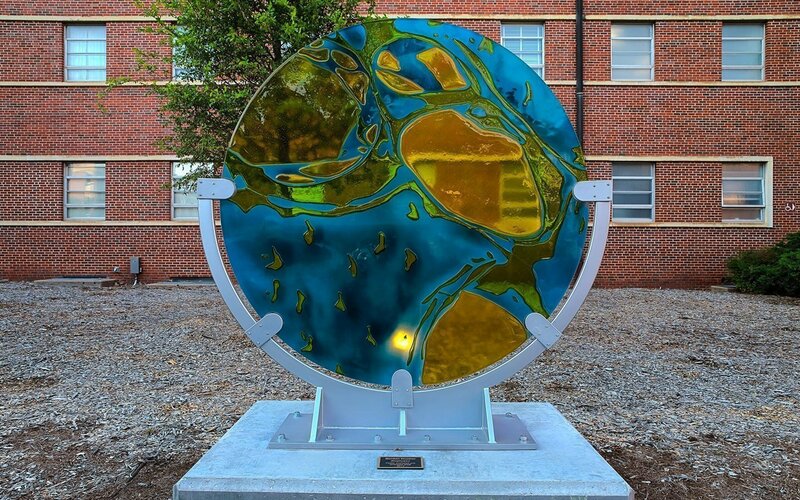 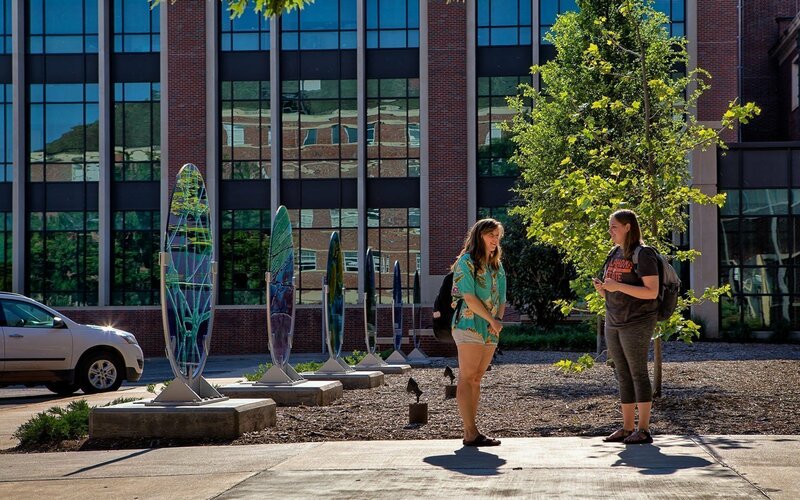 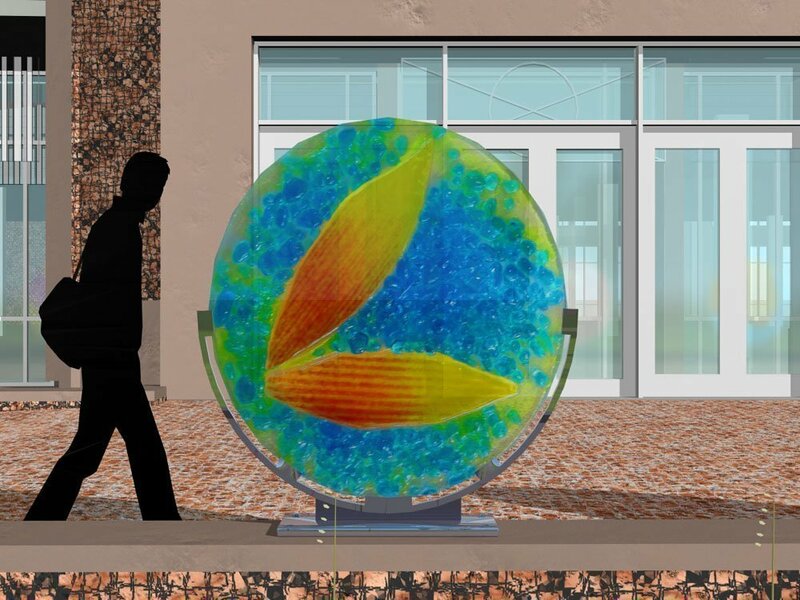 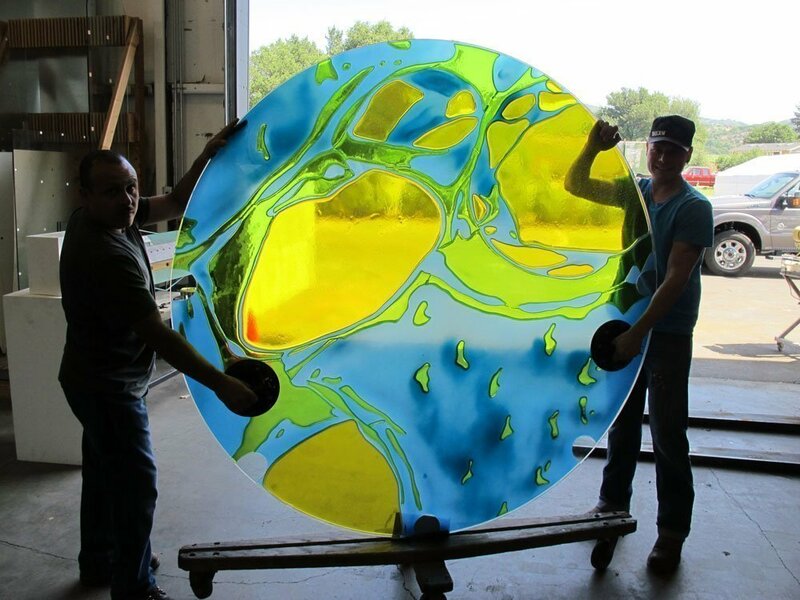 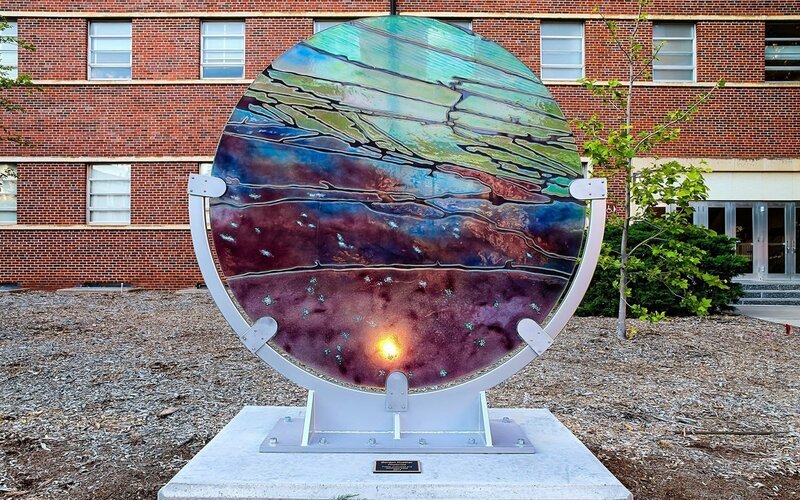 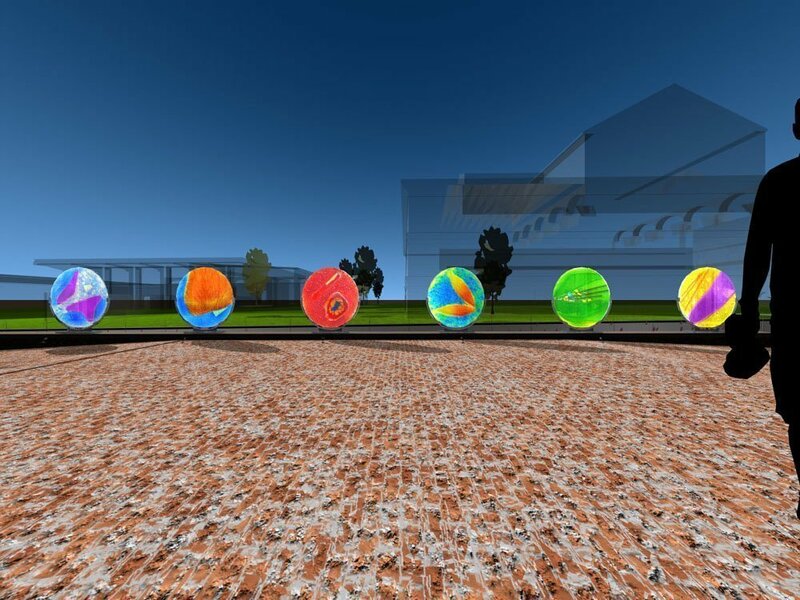 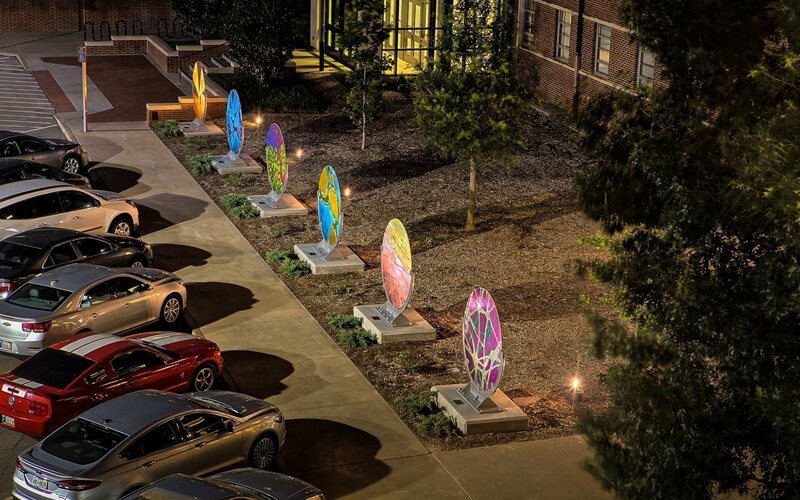 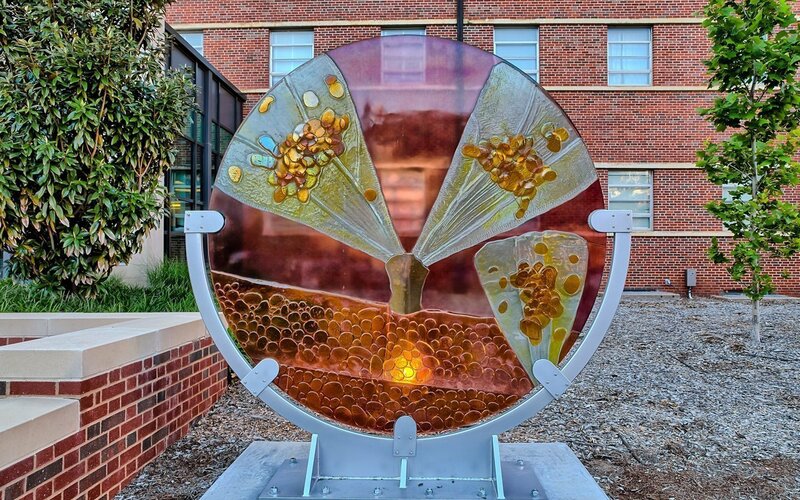 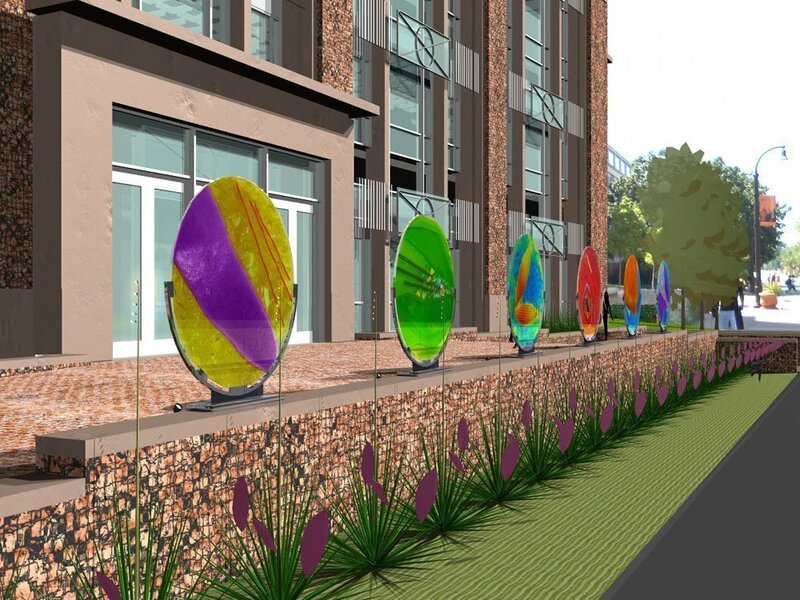 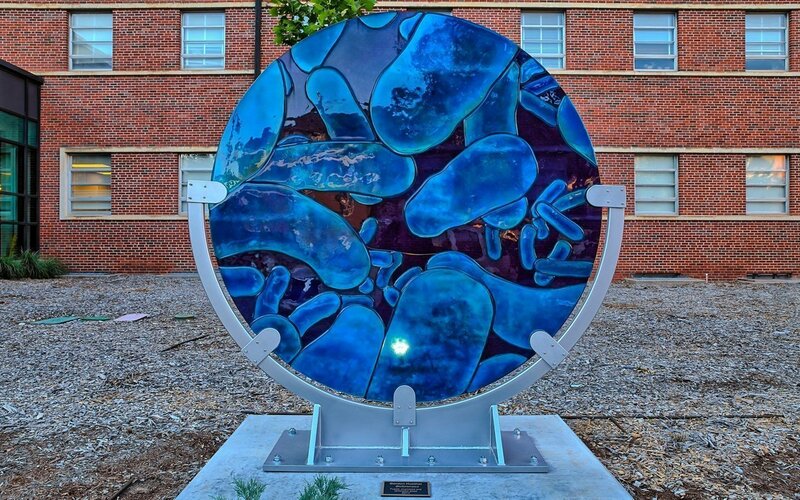 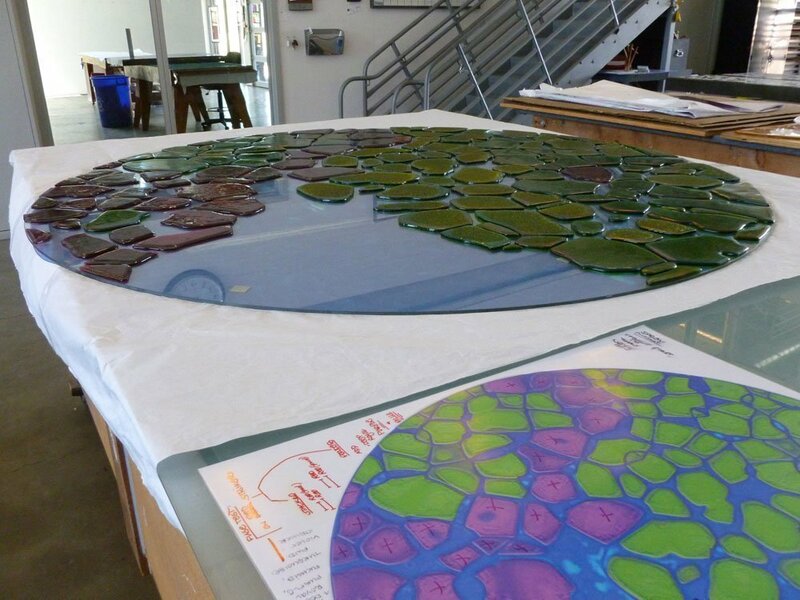 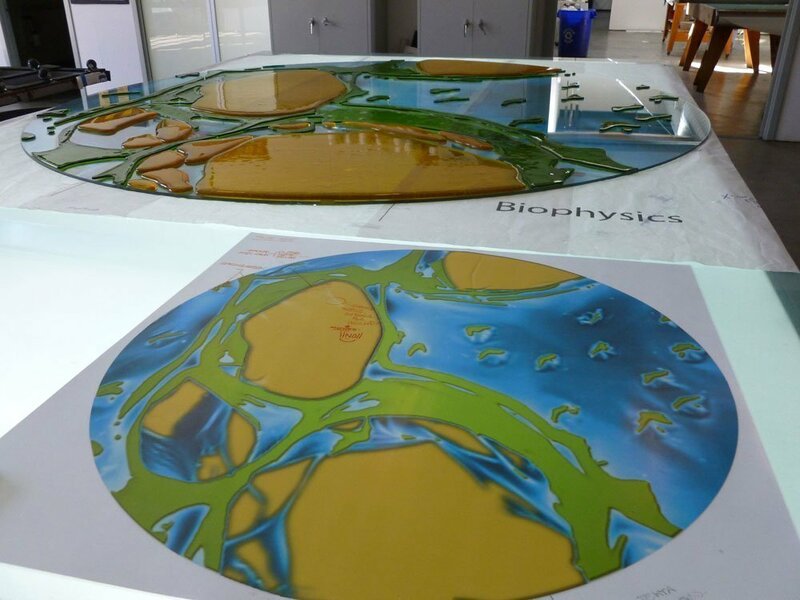 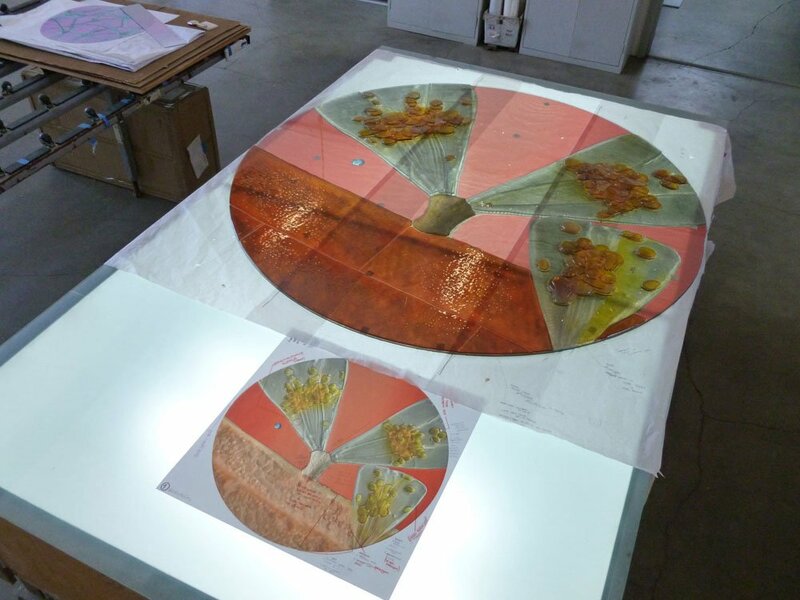 These six-foot diameter glass discs have been exclusively handcrafted for the Henry Bellmon Research Center at Oklahoma State University. 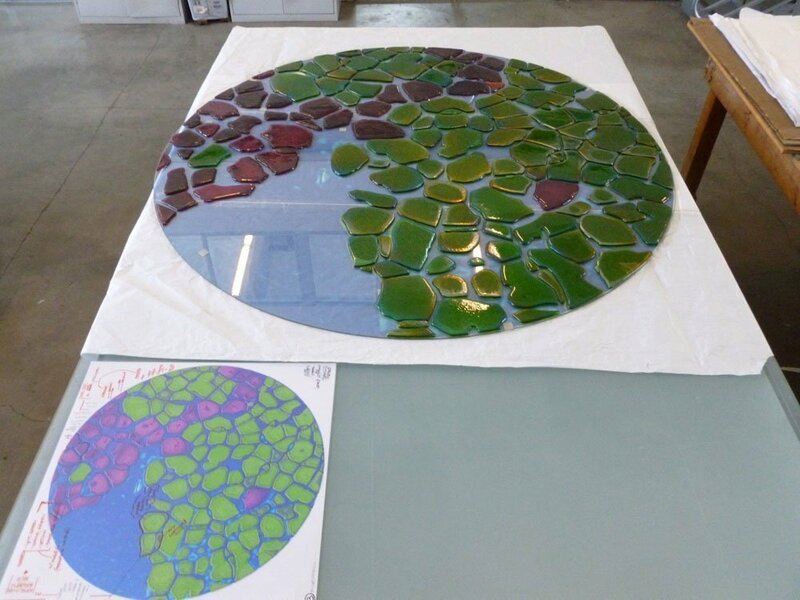 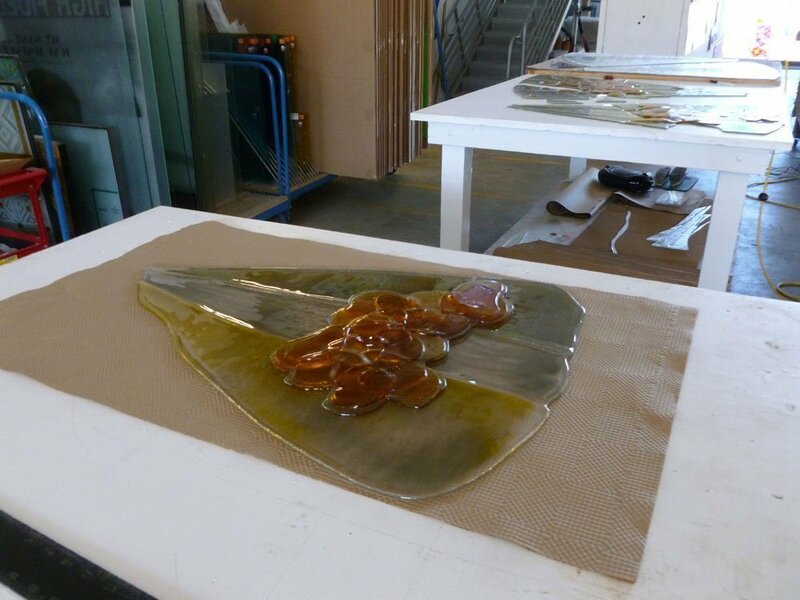 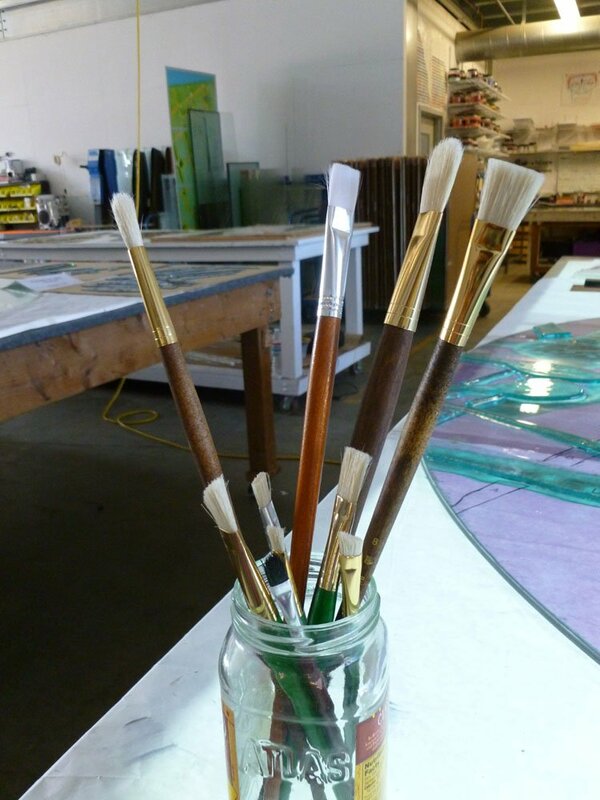 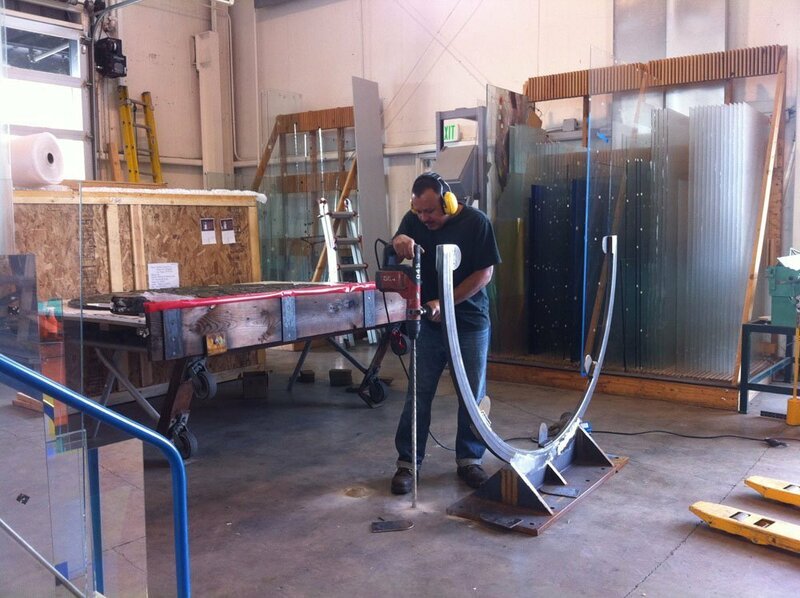 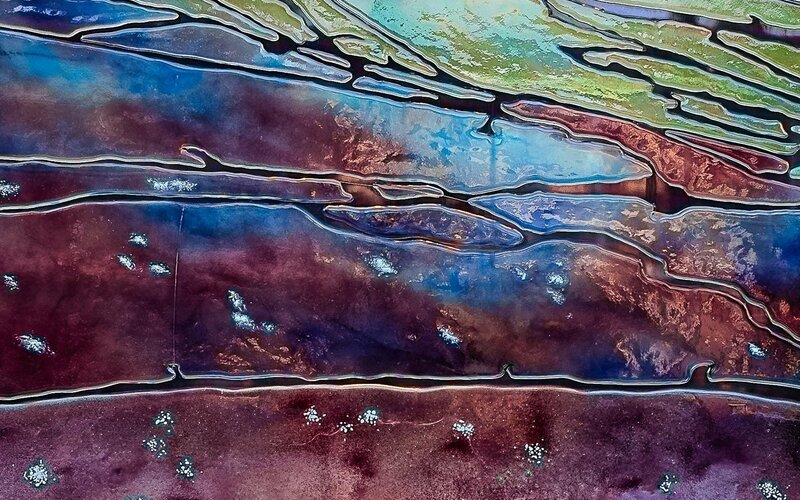 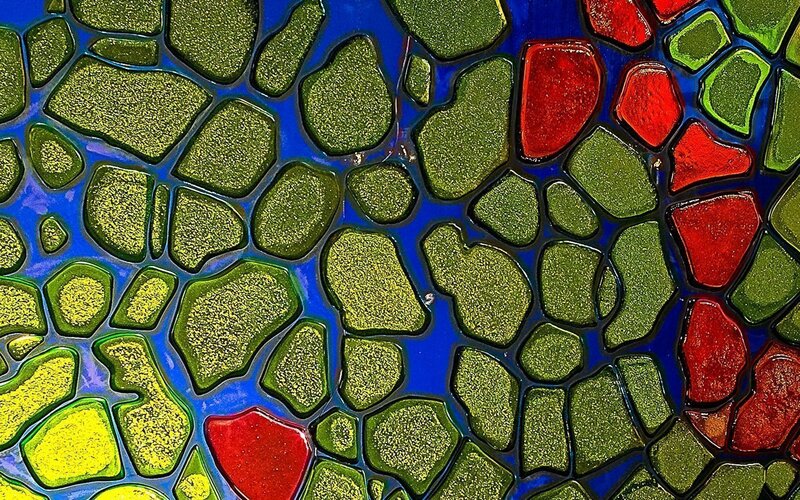 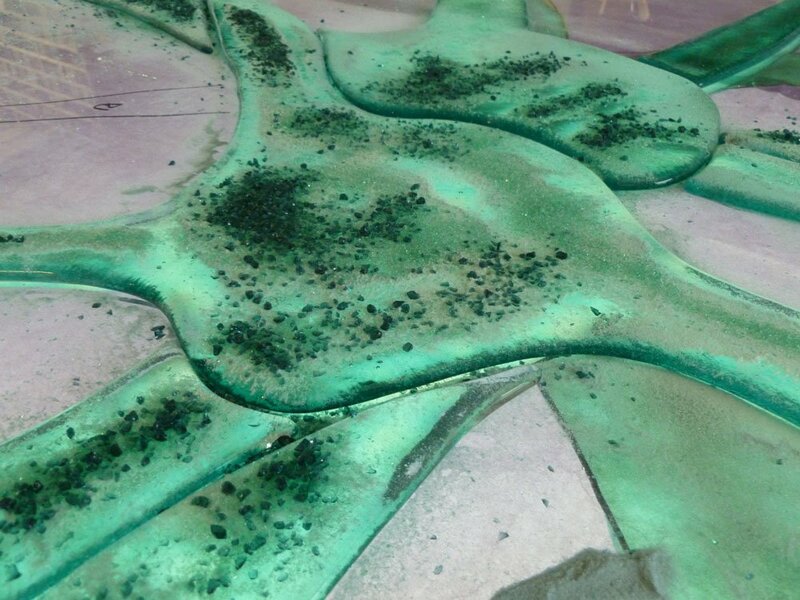 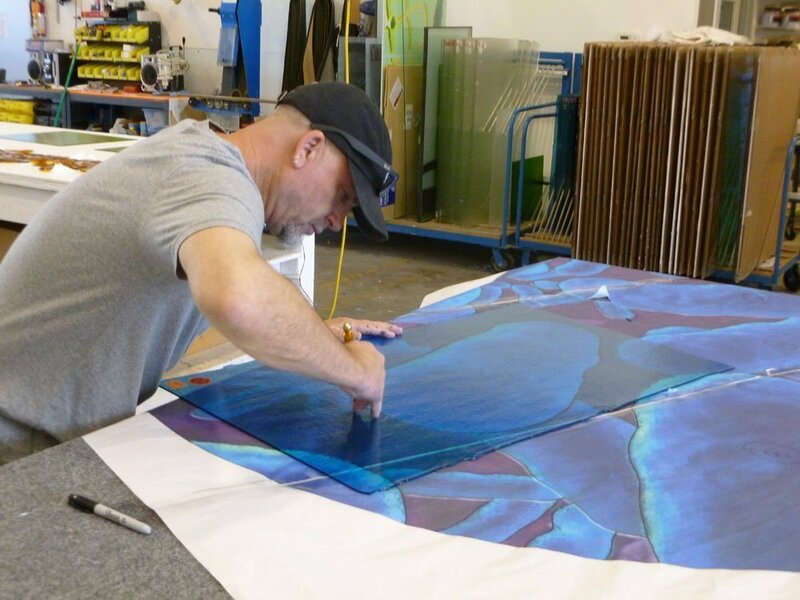 The fused glass was safety-laminated to half-inch-thick, tempered plate glass. 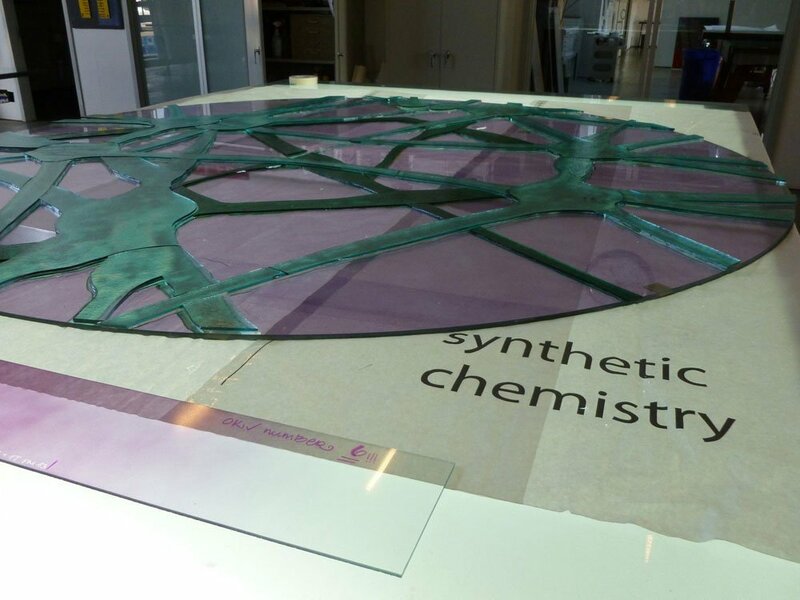 This glass is extremely strong and is similar to bulletproof glass. 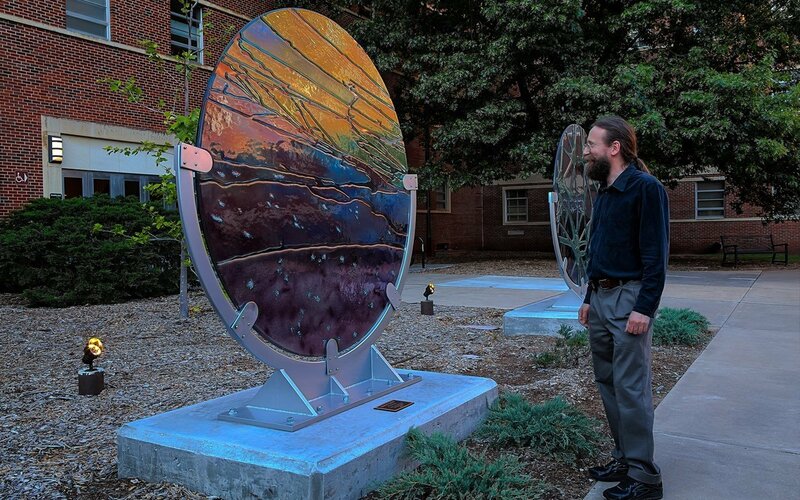 The medallions were mounted within stainless steel armatures. 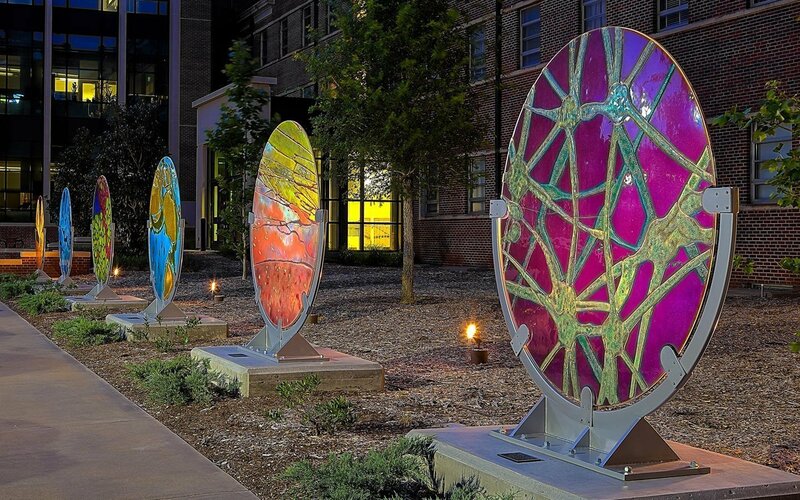 Each medallion’s design is inspired by the six respective categories of study housed within the Research Center. 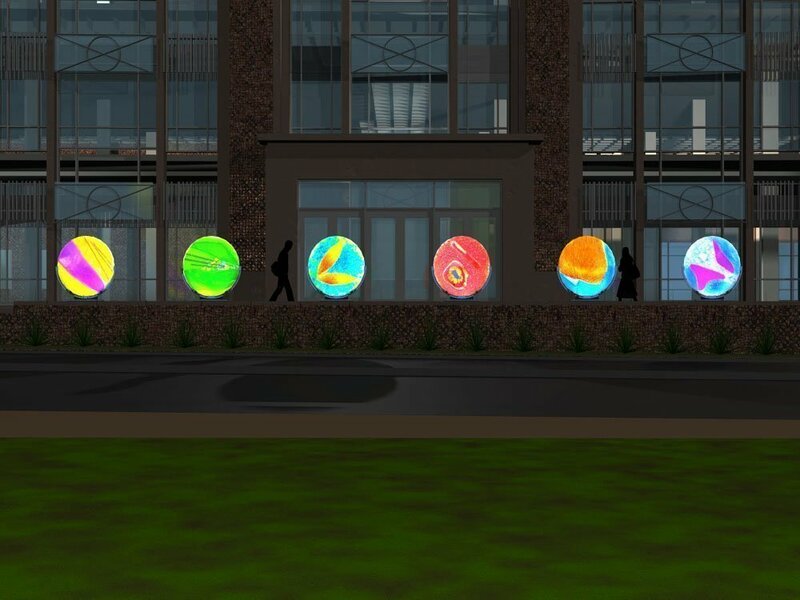 They are illuminated at night, creating beacons of light and making the artwork visually compelling and inspiring in the evening, as it will be during the day. 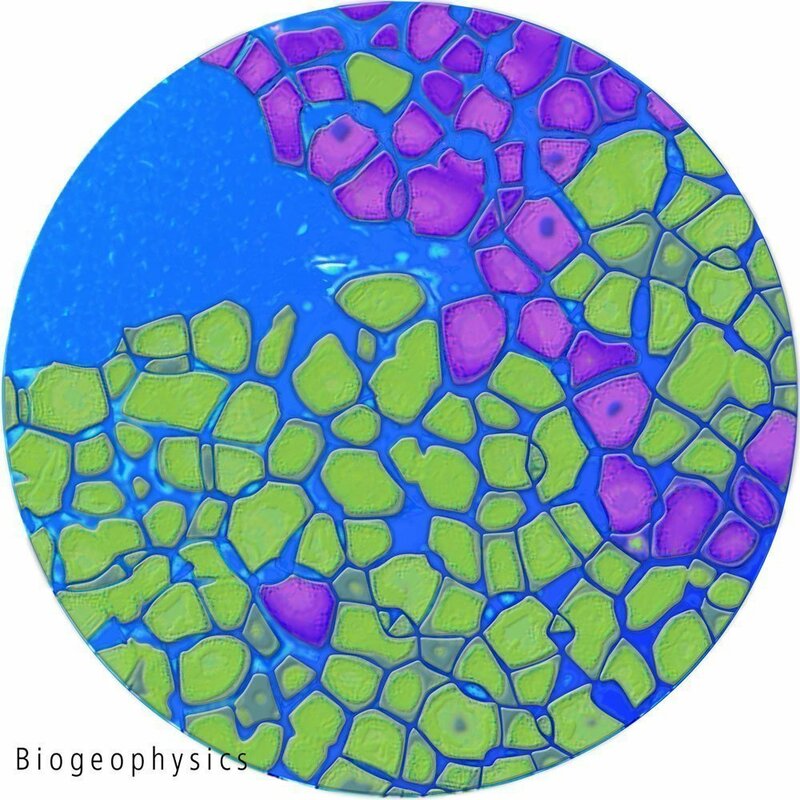 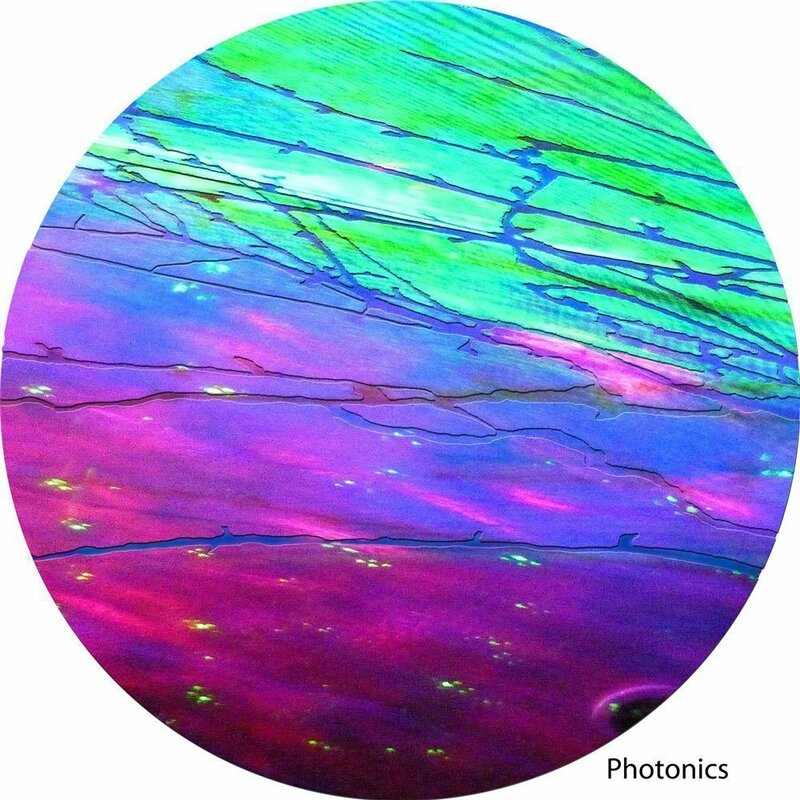 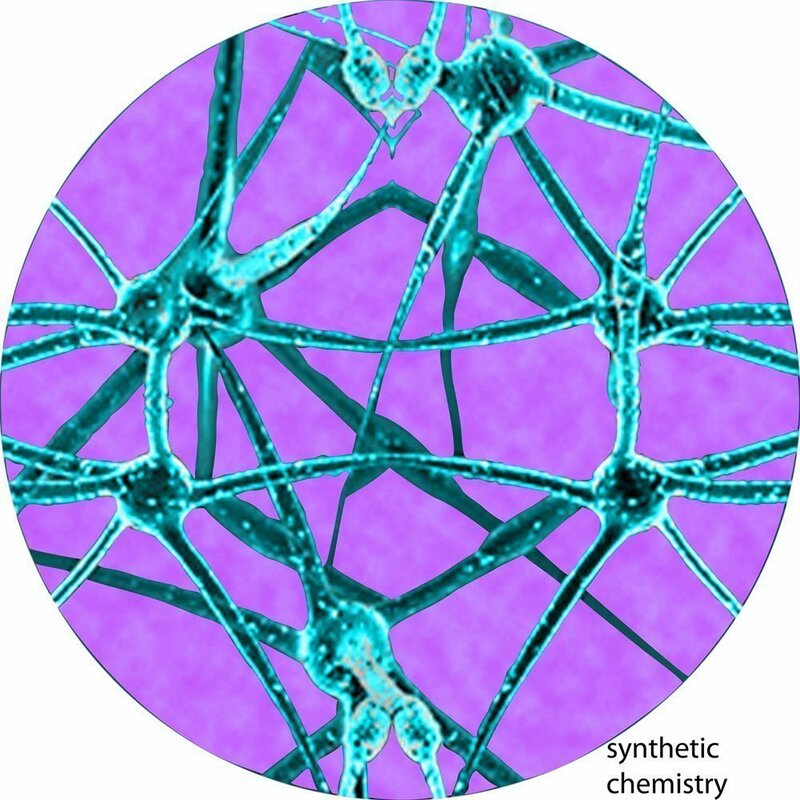 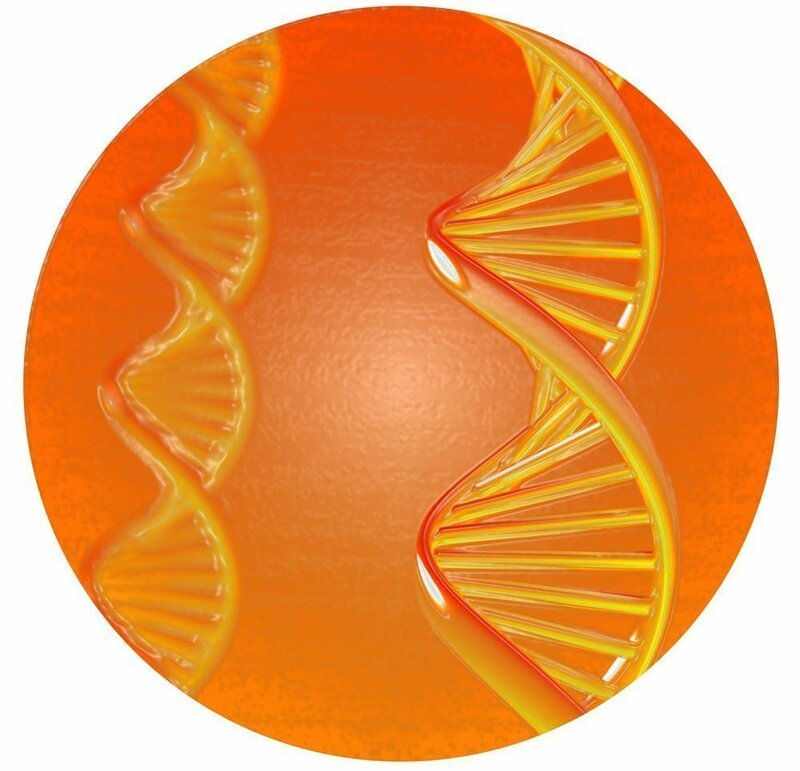 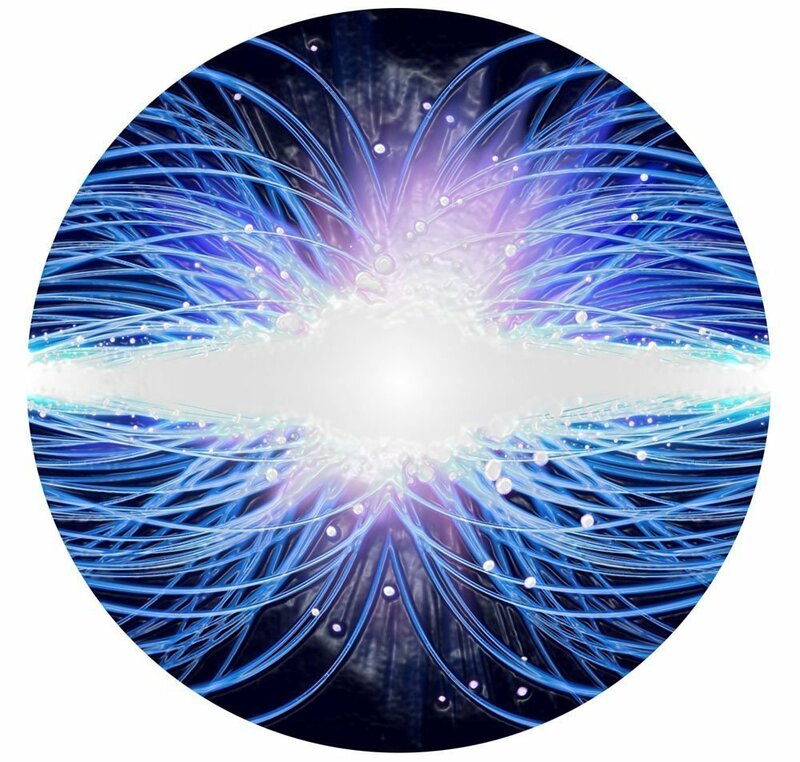 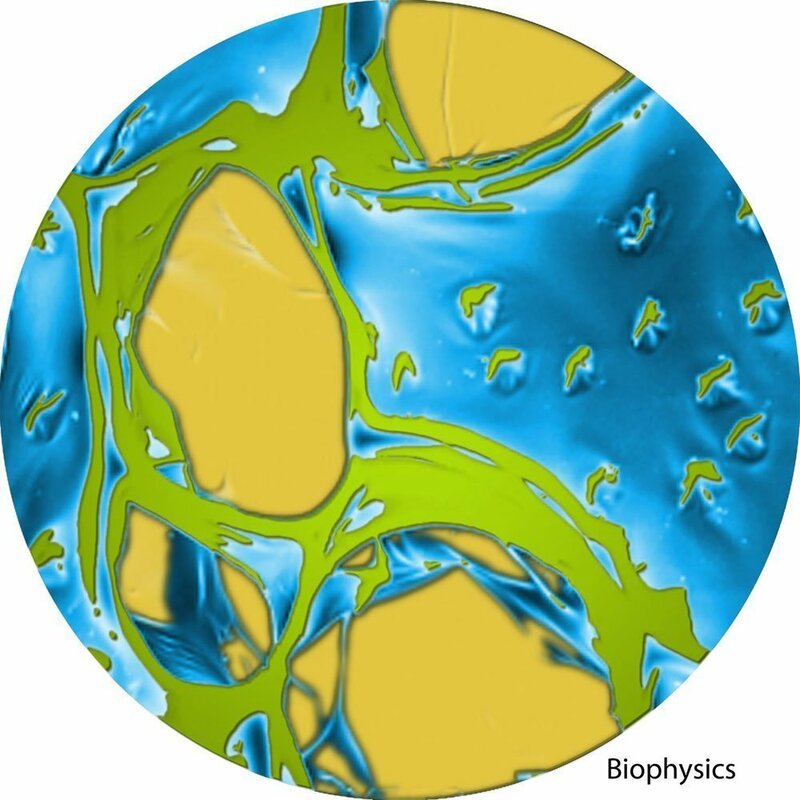 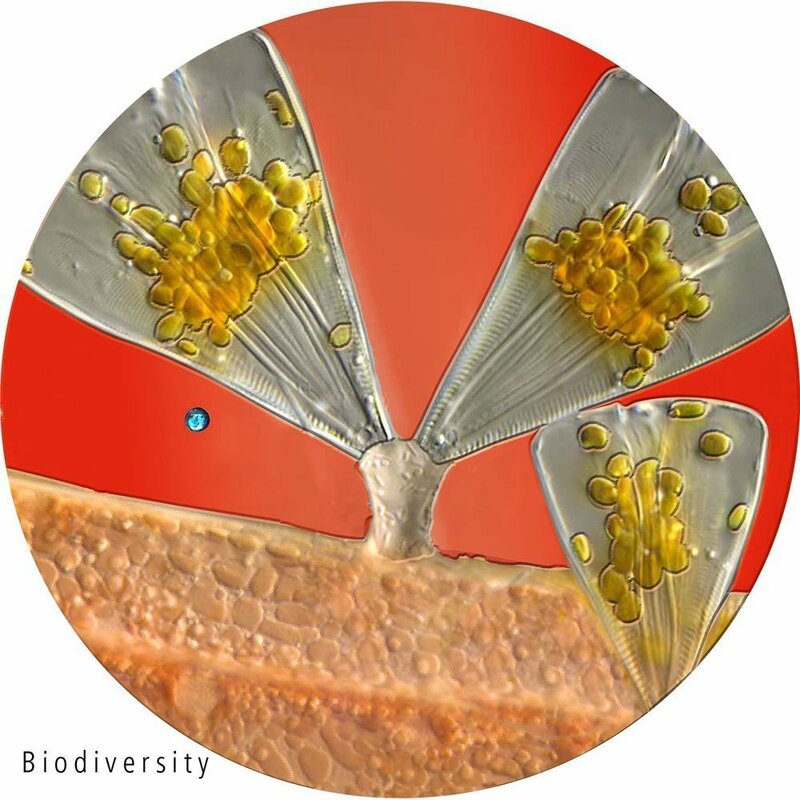 The Henry Belmon Research Center currently houses six (6) categories of study – Synthetic Chemistry, Biodiversity, Biophysics, Photonics, Bioforensics and Biogeophysics. 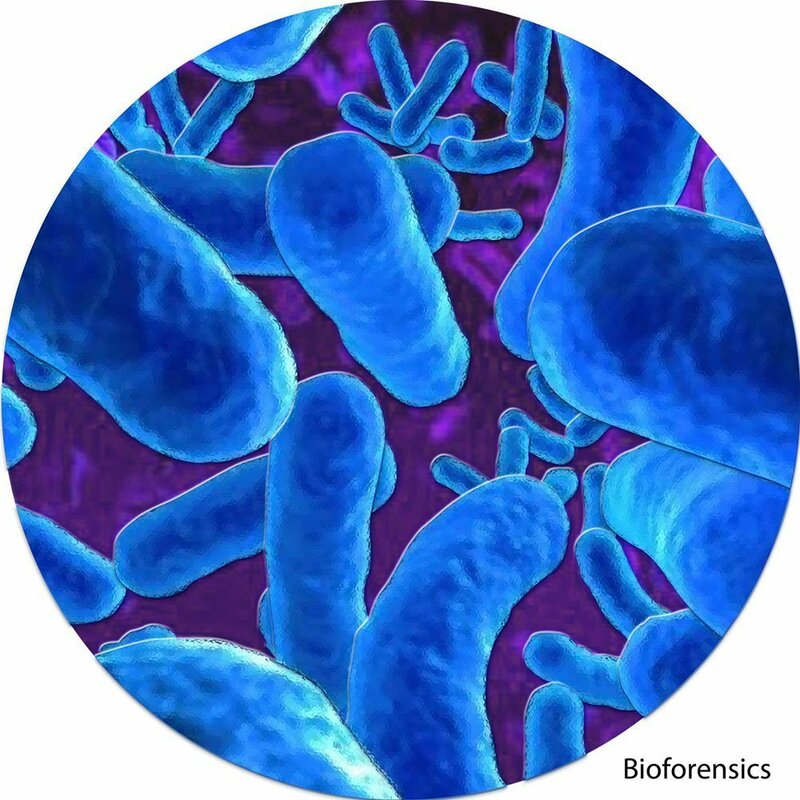 For each of these six areas we worked with the University to obtain multiple microscopic images for each area of study. 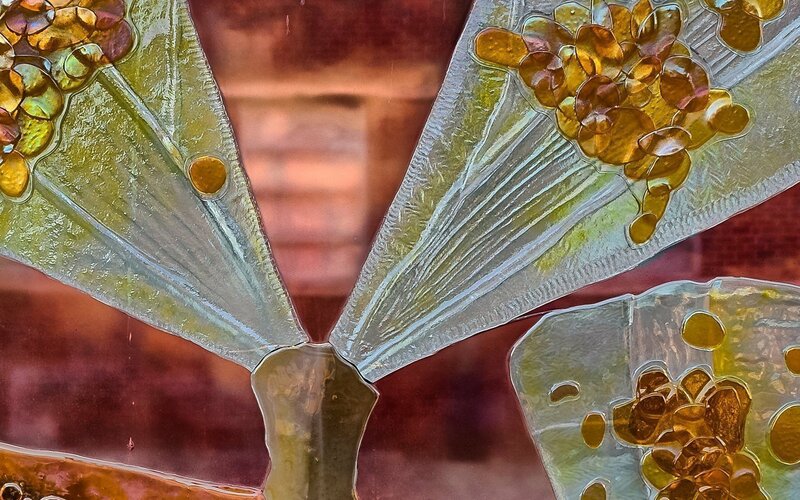 We chose one of each, digitally manipulated the color and transcribed that image from a microcosm to macrocosm. 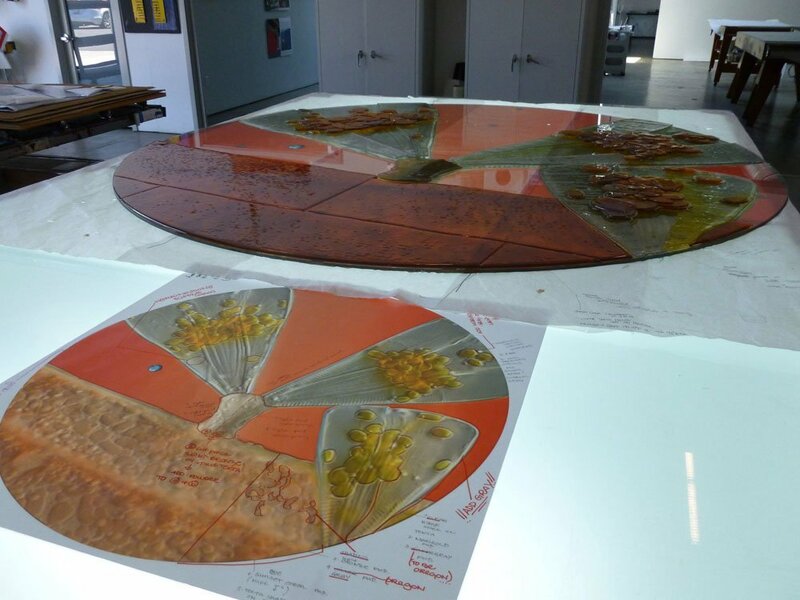 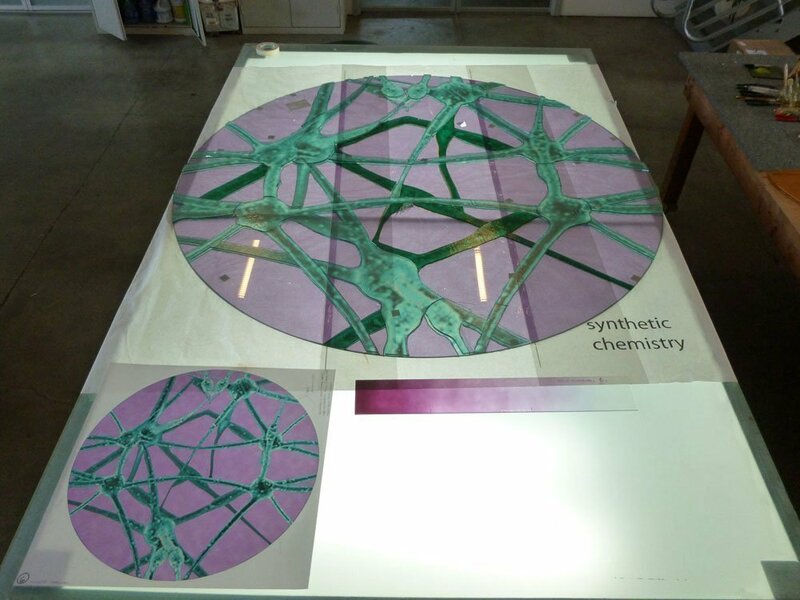 This transcription from micro to macro was manifested into 6-foot diameter, art glass disks with glass fusing, enameling and lamination. 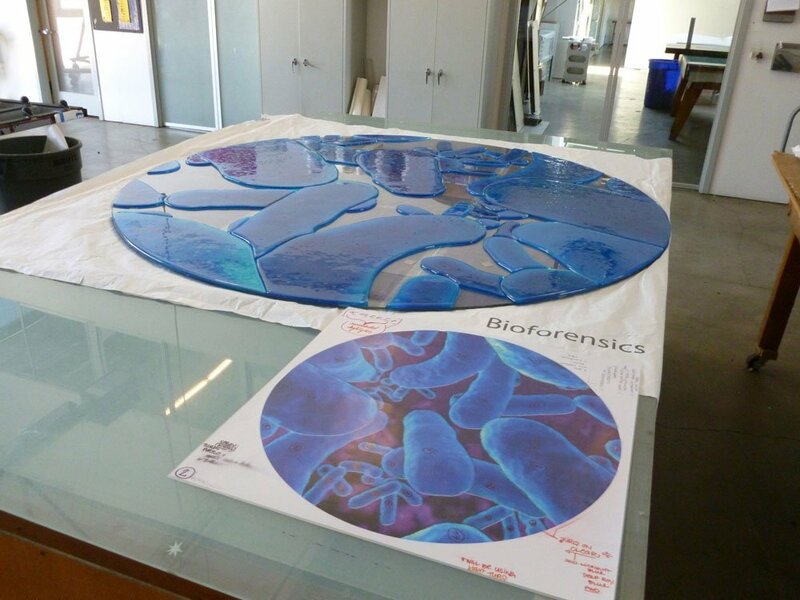 The big idea was making the often unseen beauty of science visible through the eye of an artist. 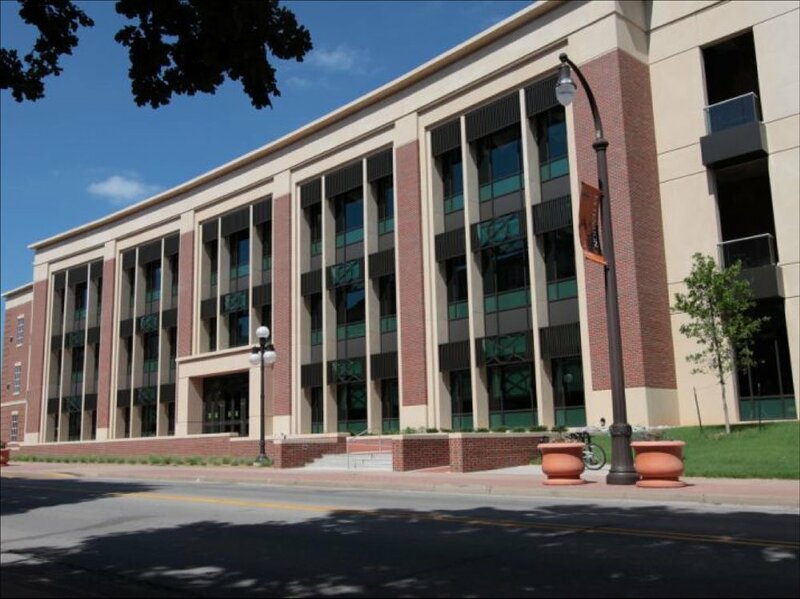 Understanding that the architecture is traditional Georgian, Huether chose a classical, traditional shape, the circle. 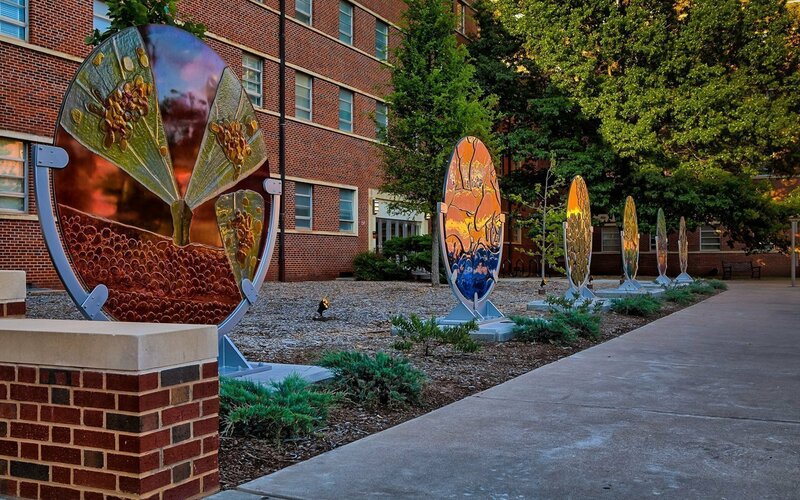 The circle also appears in the bronze railings of the building. 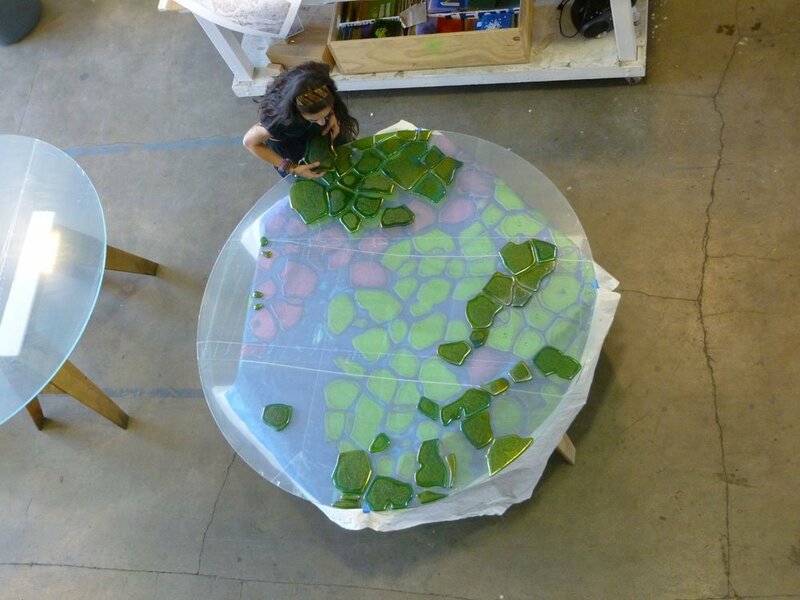 Using this shape as a repetitive form is a strong nod to the traditional architecture. 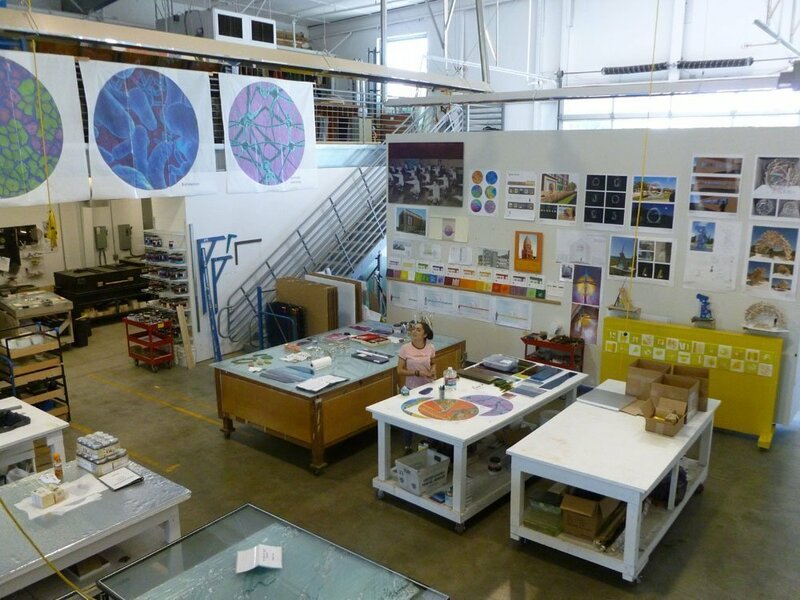 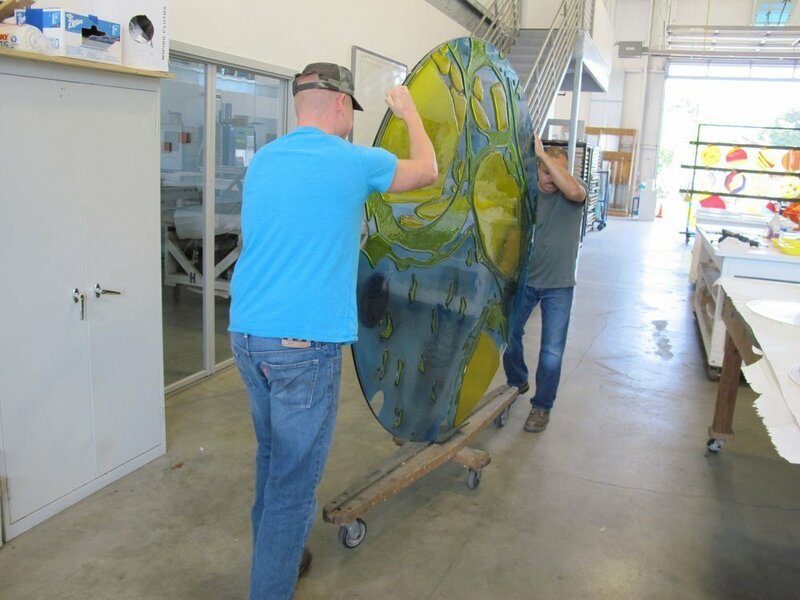 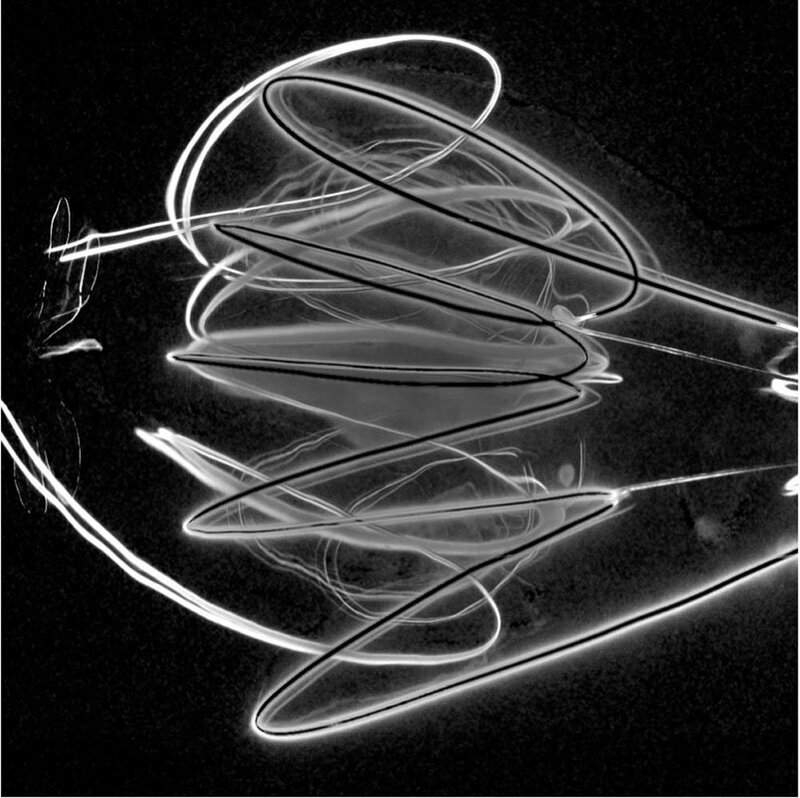 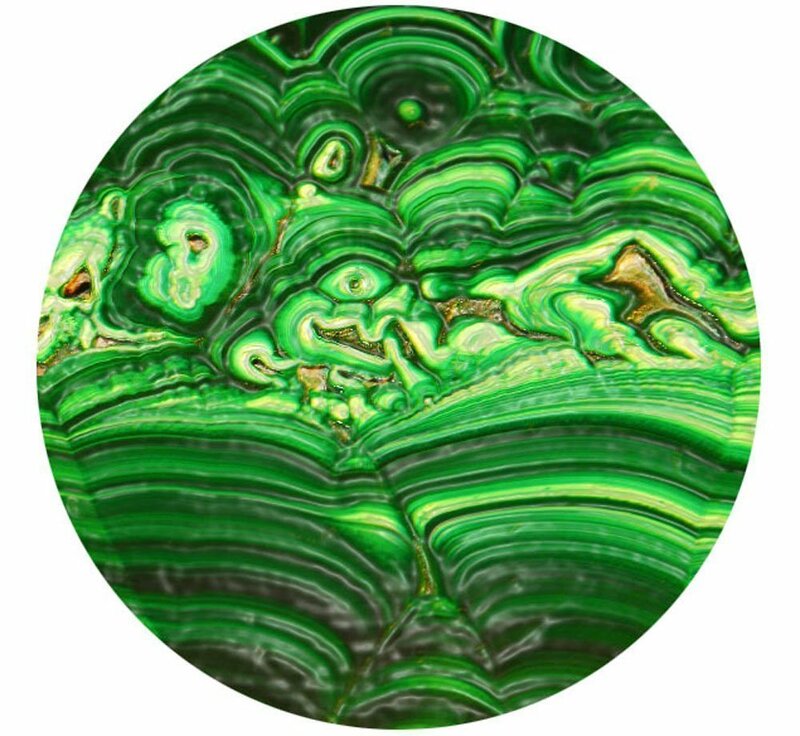 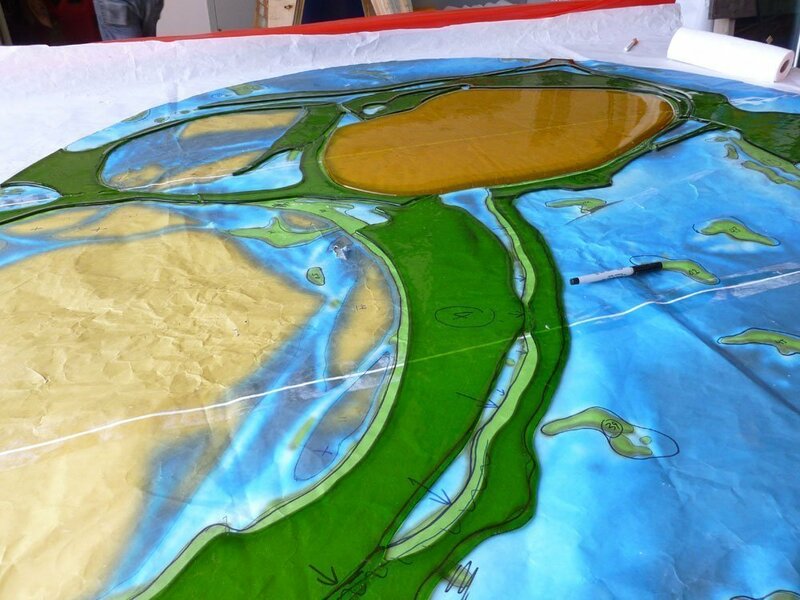 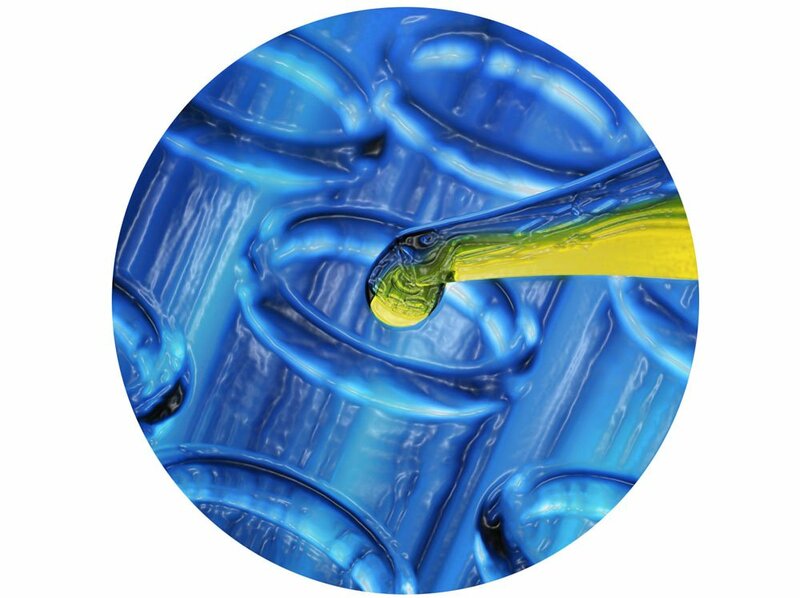 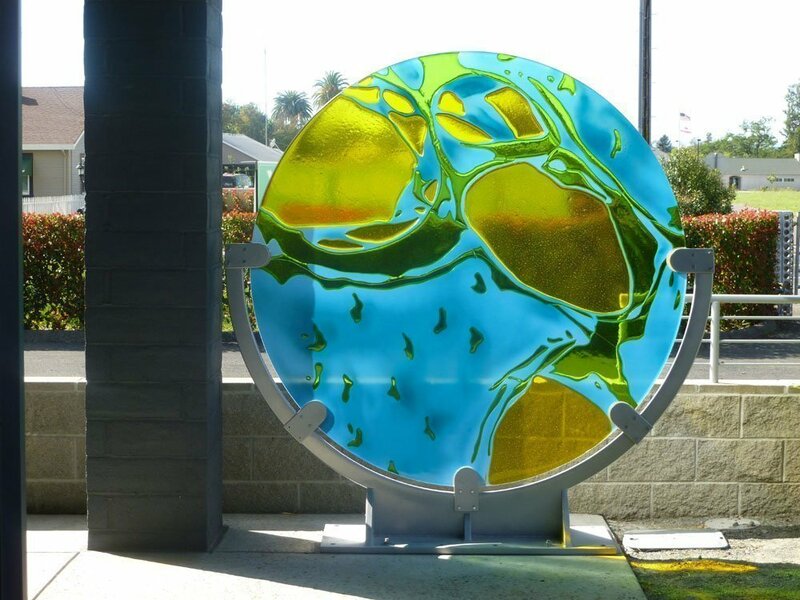 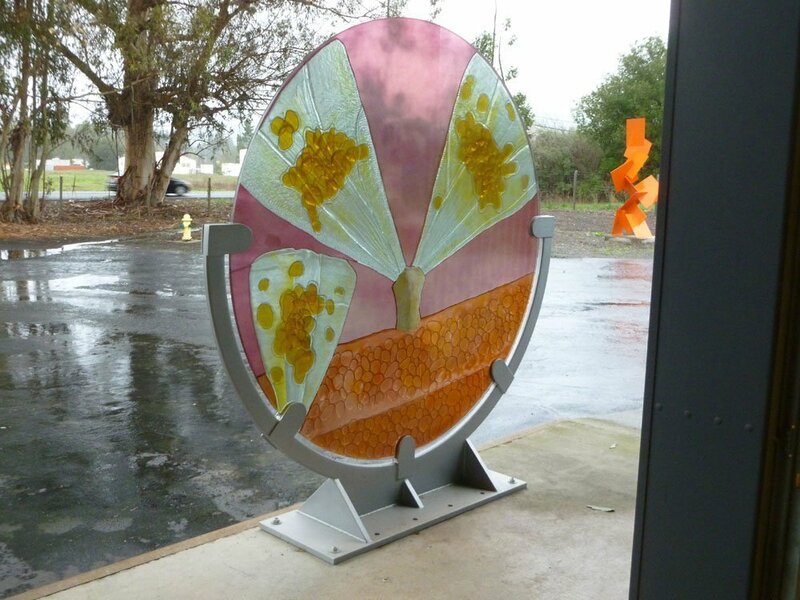 Having contemporary art glass within the circle refers to the highly technical, forward-looking research conducted inside the facility.